— “Intercomparison of Shelters in the RMI AWS Network” by Royal Meteorological Institute of Belgium. The Intercomparison of Shelters in the RMI AWS Network verified the patented & registered helical design of our solar shields (solar screens in UK) to bring unprecedented benefits in accuracy and precision for atmospheric air temperature measurement. 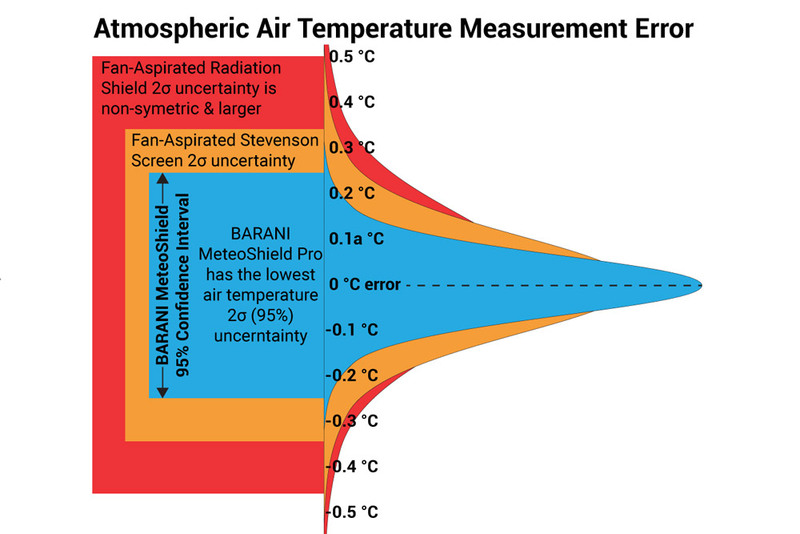 Solve all of your air temperature & humidity measurement errors. Double-helix solar radiation shield offers superior temperature accuracy and protection as confirmed by independent testing. Step up to the Helix. Protection of the helix made affordable. Single-helix is a cost-effective solution with superior air temperature measurement and sensor protection derived from the double-helix. 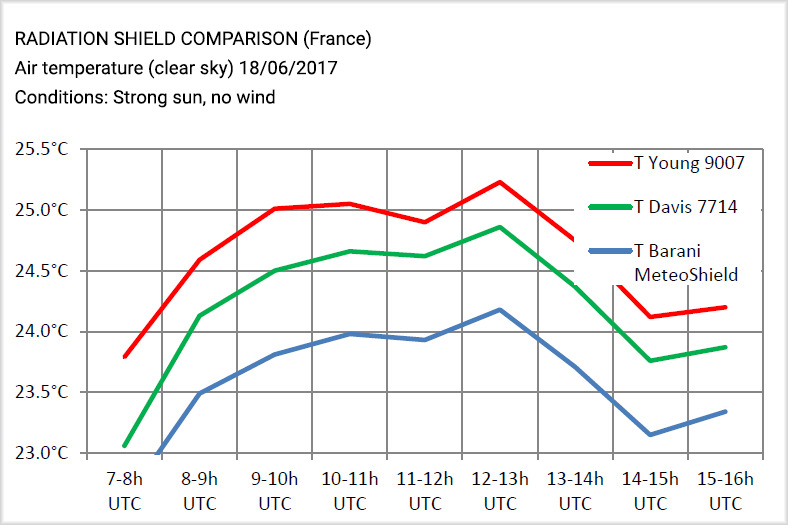 So far, in every independent comparison, the helical MeteoShield Professional has shown superior accuracy in comparison to any other solar radiation shield. It is also more accurate than naturally ventilated Stevenson screens. Weather station testing showed the helical shield keeps sensors cleaner than multi-plate shields.Master your climate measurements with most stable & accurate platform for air-temperature. Independent testing published at the CIMO-TECO-METEOREX - WMO conference as part of the Meteorological Technology World Expo 2018 confirm the superiority of the MeteoShield Pro for all types of meteorological measurements and in all weather conditions. MeteoShield Pro’s 95% confidence interval is far superior to any other solar radiation shield or screen including Stevenson and fan-aspirated radiation shields and shelters. The benefit is even more pronounced in rainy conditions. Helical MeteoShield Professional is the most stable platform to measure air-temperature accurately for climate research and urban climate monitoring. The black painted MeteoShield showed very stable measurements. In conditions of zero wind (<0.6 m/s avg. ), less than 0.35 °C increase in air temperature was seen due to the black paint. Wind speeds above 1 m/s showed no noticeable difference in accuracy. Low-wind accuracy - helical design almost eliminates effects of solar heat in low wind conditions and is more accurate than most fan-ventilated shields on sunny winter days. Free testing samples of MeteoShield Profesional are available for a 6 month loan. If you are satisfied after evaluation you can purchase it, otherwise just return the shield.